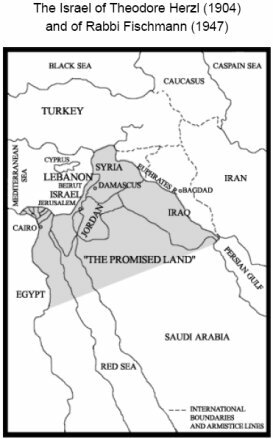 The Promised Land, 3 – do Jews really believe that? If you don’t think that fundamentalist Jews and Messianic Christians believe in such a massive expansion of Israel, look at this map on this website. If you don’t think that the Arabs are aware of the fundamentalist Jewish vision, then look at this blog. This blog includes references to Jews claiming the full territory in the writings of Theodore Herzl and in 1947 testimony to the UN. And notice that they are using the same map (misspelling ‘Caspian’, and showing Israel as including both Lebanon and the Sinai peninsula). How nice that they can agree about something. It would be nice for Palestinian constitutions to renounce the idea of the eradication of Israel. Israel could show the way by renouncing, in its constitution, the idea of the Promised Land “from the river of Egypt to the Euphrates”. This entry was posted in Religion, Society and tagged Arabs, Egypt, Herzl, Iraq, Israel, Jews, Jordan, Kuwait, Lebanon, monotheism, Palestinians, Promised Land, Saudi Arabia, Syria. Israeli’s left the idea of the “promised land” from the Nile to the Euphrat” many centuries ago.It never existed as an entity . Hertzl vision was about Palestine(west of Jordan river). The most extremist Israeli’s want the entire Palestine ( according to the Bristish mandate). The majority will accept the borders between 1949-1967 . The Chritian evangelists talk about the “biblical” Jewish state which never existed as an actual political entity, as a preliminary situation to the Armageddon war . Afterwards Jews and others will become christians . The muslims never talk in public about accepting the very existence of an Israeli state which is also a Jewish state . They may agree to a jewish minority in Palestine. As with most human societies, what people want and what people will settle for evolves according to the opportunities available. When there was no Israel, people who wanted an Israeli state were prepared to settle for something very limited. The more they got, the more they wanted. This still continues. It is ‘The Story of the Arab and his Camel’, and it is inherent in human nature. Israelis, like almost everyone, want “just a little bit more”, and always will. This isn’t necessarily bad. It’s why we don’t still live in caves without fire. But it also means we need the rule of law to allow everyone to have lives of peace, freedom and justice. Ethnic cleansing by Jewish fundamentalists has a long history. That lack of tolerance is what caused the Romans to ultimately expel the entire people from Palestine. And the thrust of my novel is that Jesus was just such a Jewish fundamentalist, and the front man for a failed insurrection. No, it’s a lovely land with some excellent people in it. The problems are caused by the government, the religious extremists, and comments like yours. You forgot the surrounding world . Israel is still a red rag for all arab countries. In Egypt the slogans during the revolution were anti Mubarack and anti- Israel…. Obama is looking after El Quaida more than 10 years after the Twins disaster . There are less than ten years since the second Intifada when every other day a suicider with a bomb killed dozens citizens on the streets , kids , women , old men and yes sometimes a soldier in vacation. Even today 2-3 quasams(rockets) a week from Gaza land fotunately in open space in the south. maybe some of us are extremists ( as everywhere) , but I do not see a reason to believe in any arab country regarding good will for Israel.